Costs – Tree and stump professionals in Charleston, South Carolina charge various prices for their services. See what the median costs are so you’ll have a price in mind when you call. FAQs – Find out more about the Charleston tree scene, including rules and regulations of the city, native trees that thrive, what not to plant in the city, and some of the more popular trees to consider putting down in your yard for the long haul. Services – Know which trees you need to pull up or plant? Find out which tree service professional is closest to you in Charleston. How Much Do Tree Services Cost in Charleston? Part of what makes Charleston, South Carolina so beautiful is the array of trees that provide a contrast to the many rivers flowing through the city. To keep the trees on your property looking their best, professional help may be needed, and this guide can provide an estimate of costs for various services. How Much Does Tree Removal Cost in Charleston? Dead or drying trees should be removed promptly from your property before they fall and do damage. While you can use a chainsaw to remove it on your own, professionals will tether the tree and ensure it comes down safely. This can be costly, roughly $715, but it is worth the expense. If you have a use for fire wood, tree removers can even chop and stack the wood for the winter. How Much Will Stump Removal Cost? Trying to remove a stump on your own takes lots of time and may not end up looking attractive. Instead of making it a DIY project, consider paying an average of less than $132 to have professionals bring in a large grinder and tackle it for you. Pruning is an important step in total tree care that ensures the inner portions of the tree receive plenty of sunlight. Trimming, on the other hand, keeps trees in an attractive shape and prevents them from taking over on your property. Both are best done in the cooler autumn or winter months, and hiring professionals to tackle the job can be a big time-saver. Expect to pay between $265 and $335, well below the national average, for these services in Charleston, South Carolina. Whether you are a brand new resident who just moved to Charleston or you are simply thinking about making some changes to your property, you might be curious about the regulations and restrictions related to trees in the area. Read on for details on both as well as tree facts and local tips that will help you create a wonderful outdoor area on your land. As a historic city, Charleston strives to retain as many old trees and shade trees as possible. To that end, homeowners have some restrictions in place when removing trees on their properties. The Zoning Administrator has to approve permits for the removal of any trees that are considered grand, which means that they are non-pine and have a girth of more than 24 inches. If legally removing trees on your property, aim to have it done before the winter frost or before the lawn grows in later in the spring. SCE&G, the primary electricity provider to most of South Carolina, recommends that residents do not plant any trees along the transmission line right-of-way, and they also suggest that no tall trees are planted within 30 feet of any overhead power lines. SCE&G will trim trees that look as if they may become a problem to overhead power lines, and that includes any trees on private property. While Charleston is best known for its large shade trees, many home gardeners are able to successfully grow a number of different fruit trees on their property. In almost every case, growing fruit trees requires more care and maintenance than shade trees, but having fresh fruit may be worth the extra effort. Figs, pears and apples all do well in Charleston, and many residents put in the extra time and care for fruits like lemons, oranges and bananas as well. 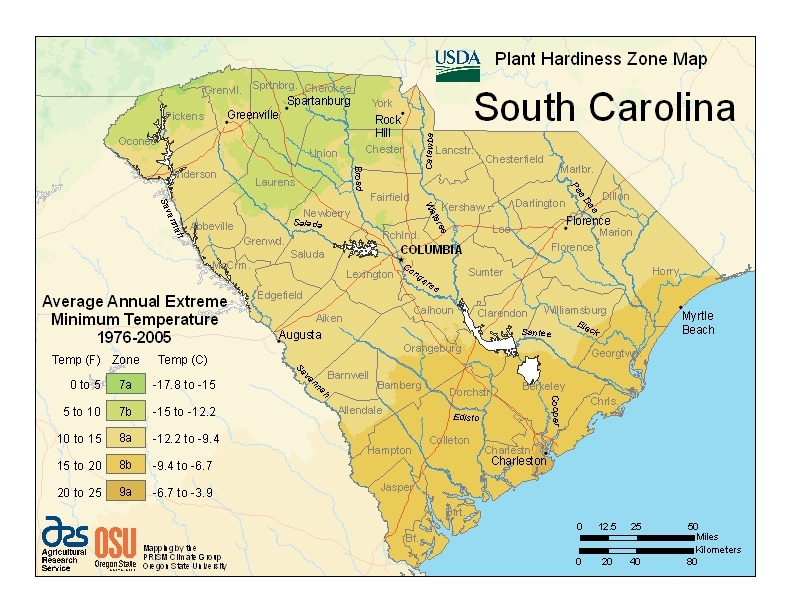 One of the best ways to tell if a tree will grow well in the Charleston area is to take a look at the USDA hardiness zone map. In Charleston, rated as a zone of 8b/9a, some of the best options include sugar maple, weeping willow and leyland cypress. Those with a much lower or higher rating are likely to require more work or even die altogether in the Charleston climate. It’s important to also be aware of invasive pests and fungi that sometimes threaten the beautiful trees in Charleston as well as the rest of South Carolina’s coast. Major pests include aphids and emerald ash borers, and some of the most common diseases include wilt, chlorosis and laurel oak disease. While every state has a state tree, no other state has such a close association with any one tree as South Carolina. The state tree is the cabbage palmetto; it can be seen up and down the coast as well as in artwork. This iconic tree is perhaps the single most recognized symbol of South Carolina. Angel Oak always come up in conversation in relation to large trees in the state. This incredible oak is located 12 miles away from Charleston on St. John’s Island, and it stands at more than 65 feet tall. 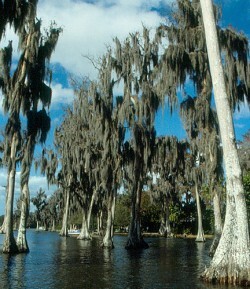 At more than 1,500 years old, it is believed to be one of the oldest trees on the Eastern Seaboard. 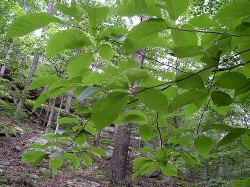 Much smaller ornamental trees found in the area include the eastern redbud, the American hornbeam and the winged elm.